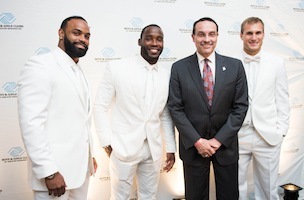 Redskins Niles Paul, Pierre Garçon and Kirk Cousins with DC Mayor Vincent Gray. Photo cred: Joy Asico. Last night, Washington Redskins philanthropist Pierre Garçon hosted his second annual All-White charity event, benefiting the Boys & Girls Clubs of Greater Washington (BGCGW) at the Millennium Building. Unfortunately for FishbowlDC, we missed the “All-White” memo and wore grey pants and a blue button down. The event raised $100,000 for the charity, more than three times the amount of last year’s donation. Click through for those in attendance. Hip hop legend Biz Markie, DC Mayor Vincent Gray; Washington Redskins head coach Jay Gruden, ESPN’s Britt McHenry, Washingtonian’s Kate Bennett, Moki Media’s Dannia Hakki and Maha Hakki, BGCGW National Youth of the Year Kiana Knolland, BGCGW Chief Development Officer Paul Alagero, and 20+ Redskins players including Ryan Kerrigan, Kirk Cousins, Trent Williams, Brandon Meriweather, Kory Lichtensteiger, Kai Forbath, Colt McCoy and Niles Paul.